In 2010 and 2011, the Women's Refugee Commission (WRC) trained approximately 200 practitioners in six countries on designing economic interventions as a tool of GBV prevention. 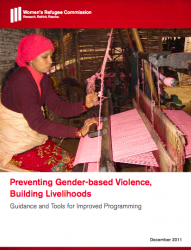 This guidance builds on that work and draws on lessons from 1) workshop participants, who incorporated women’s and girls’ protection into their livelihood or GBV programs; 2) 440 interviews with practitioners and refugees at camps in Kenya and Ethiopia; 3) desk research; and 4) over 40 expert interviews. The WRC found that the evidence of impact on protection from livelihood approaches in crisis settings is scarce, and that the literature on impact from noncrisis settings is frag- mented and focuses predominantly on domestic violence. This guidance is therefore based on promising practices on how to design safe economic programs and livelihood activities.